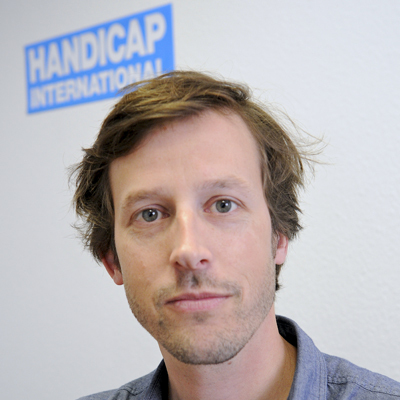 Thomas Hugonnier, Head of Handicap International’s Mine Action programme, oversees the organisation’s clearance activities in Iraq, which aim to protect civilians from explosive remnants of war in the country. What makes Iraq unique, in terms of demining activities? The situation in Iraq is unlike anywhere else. Humanitarian organisations usually only start demining operations in a country once a conflict is over and peace agreements have been signed. The conflict in Iraq is still on-going but due to the nature of the explosive remnants of war we find there, we need to intervene immediately in order to protect people’s lives. Many areas are affected by fighting or threatened by armed groups. More than 3.3 million people are displaced inside Iraq. These displaced people who try to return to their homes once a region has been liberated face serious risks. Handicap International helps to ensure families who return to their homes do not put themselves in danger. The organisation also works to eliminate the threat these returnees face. Another factor that makes Iraq unique is the kind of explosive remnants of war found there. Handicap International’s teams don’t just have to deal with mines, which in conventional conflicts are recorded and classified, and whose risk can be identified. Our demining and clearance experts also have to adapt to a type of threat and to other complex and insidious weapons, like improvised explosive devices (IEDs) - by definition very random technology - to which humanitarian actors have not been exposed in the past. It’s a delayed-action war because in these areas the fighting is over but casualties continue to rise even though the fighters have left. How is Handicap International tackling this new challenge? To protect people from explosive remnants of war and improvised explosive devices, we needed to find an adequate response to this major challenge. This is why we have decided to work in areas where armed groups have installed improvised explosive devices. We have conducted more than 90 non-technical surveys over the last few months. These surveys help us to identify danger zones, to reference and to mark them so that we can alert local people of the danger. Our survey reports are then sent to authorities authorised to give us the go-ahead to clear pre-identified areas. What’s more, our weapons clearance experts are currently developing procedures and training on the handling and neutralisation of improvised explosive devices in the field, since international humanitarian response standards have yet to be defined for this type of weapon. At the same time, and because it is necessary to save lives, our mobile teams run daily risk education sessions on explosive remnants of war to alert people living or displaced in contaminated areas to the dangers and the correct actions to take. Why is Handicap International’s work essential in Iraq? The level of contamination is unprecedented: there are explosive remnants of war and improvised explosive devices in fields, homes, sometimes inside corpses, or behind refrigerator doors. The quantity and diversity of these explosive remnants is also something we’ve never seen before. Building on its weapons clearance experience around the world, Handicap International has an important role to play in Iraq. The organisation has also been working in Iraq for more than 25 years through its development projects, and it launched an emergency response in the country in 2014. Activities including physical rehabilitation and psychosocial support, risk education on explosive remnants of war, and the inclusion of people with disabilities in humanitarian response have been decisive in making it easier to access certain areas. We now perform these activities in tandem with our weapons clearance activities. As a humanitarian actor, it is our duty to help the Iraqi population, and particularly the most vulnerable people, most of whom find it difficult to access basic social services. Some people are also not aware of the risk from explosive remnants of war. The aim of weapons clearance is to make it safer for these people and easier for them to return to their activities, reopen their businesses, work in the fields, etc. Handicap International has set itself the goal of providing a global response in order to give assistance to host communities and displaced and/or returnees.